Here are some links to panels and the presentation I gave at the American Historical Association Annual Conference on January 4, 2019. BTW, if you want to read a full written version of the talk, there’s a link to a PDF version of it in the transcript section below. Unlike all the other episodes, today there is no verbatim this is not a verbatim transcript of the audio of the episode. Although I did not read the paper aloud when I gave the presentation in Chicago (I never read from a script when I give my presentations), as part of the conference requirements I did prepare a complete written version of the paper. So, in lieu of a transcript of today’s episode, click here to download the entire written version of the paper. … That was the end of my talk, which is part of a panel of papers about women photographers spanning from 1840 into the 20th century. By the way, I’d really like to thank Kelly Midori McCormick for inviting me to organize those panels with her. I started chatting with Kelly back in the fall of 2017. She’s a grad student currently finishing her PhD at UCLA her research is on women photographers, albeit mid-20th century — but a mutual acquaintance introduced us and, well, our conversations were great. and one thing led to another, and ultimately led to our organizing these two panels about women photographers at the American Historical Association’s 2019 conference. Anyway, I really wanna thank Kelly. It was so much fun working with you in putting together these panels for AHA2019. In a lively discussion after the panel talks were finished, someone asked me if it’s possible to tell from looking at a picture if it was taken by a man or woman. Well, this was actually great that someone brought this up … because it’s actually another myth. 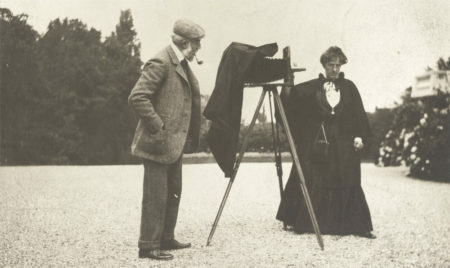 There is a notion that was actually common even in the 19th century that perhaps men and women took pictures differently. And that’s it apart from the idea that women maybe took more baby pictures … as we’ve already seen. that that’s a myth. When you look at the artisan photos of people taken in the studios, you can’t really tell by looking whether or not the picture was taken by a man or woman. They were using the same techniques … they were using the same types of backdrops … they were using the same types of props …or, they were using <em>no</em> props or backdrops at all. Anyway, the rest of the episode’s content is in the body of the copy of the paper, which is linked above. BTW, in lieu of the slides I used at the conference that had samples of the women’s photos and advertisements, I instead have put links in the notes above to previous episodes and episode notes that have the same information – and more! And, as always, thanks so much for stopping by! Until next time, I’m Lee, and this is Photographs, Pistols, & Parasols.